Dorcas Aid International, Maji Milele Foundation and North Gem Community Based Organization. The final survey, design and preparation of tender documents, tender evaluation and the award culminating in the project launch today has been as engaging as partnerships can be and the patience of the stakeholders is laudable. 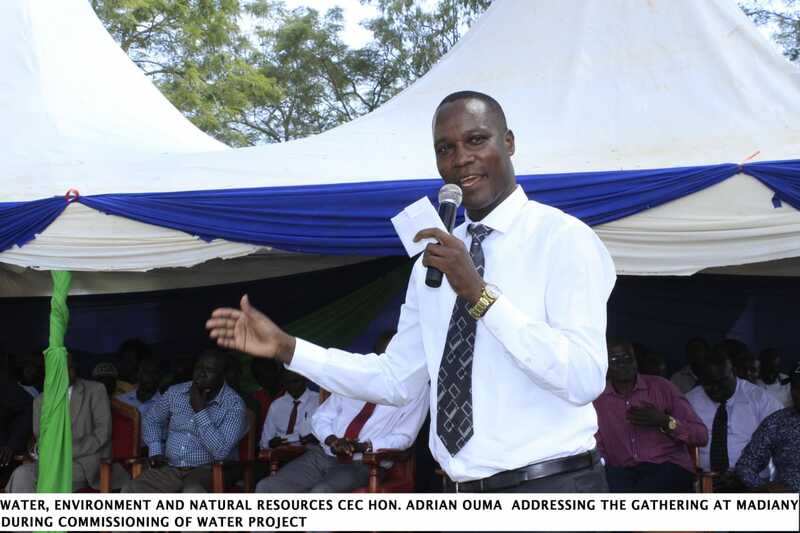 Initially the project was to cover 19 water schemes within Siaya County which were later reduced to 5 water schemes after pre-feasibility study. 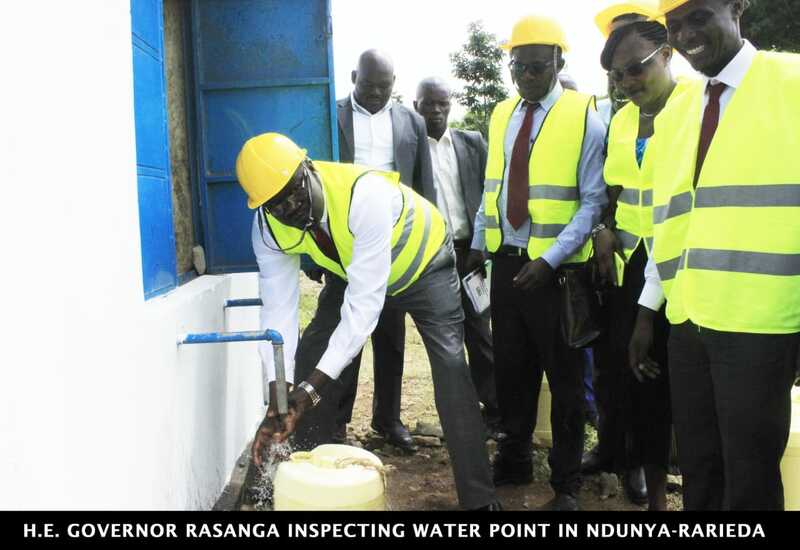 The study identified Sira-Nyawita Water Scheme and Naya Water Supply Scheme both in Ugunja Sub-county, Masat Water Supply Scheme and Yesise Water Supply Scheme both in Ugenya Sub-county and East Uyoma Water Supply Scheme in Rarieda Sub County. Upon technical assessment of all the water schemes by a water consultant after the pre-feasibilty study, we agreed to pilot with one large water scheme in East Uyoma, Rarieda Sub County and one small water scheme being Naya in Ugunja Sub County.These two are the water projects we are launching today. The common practice is that most rural water supply are managed by community water committees. 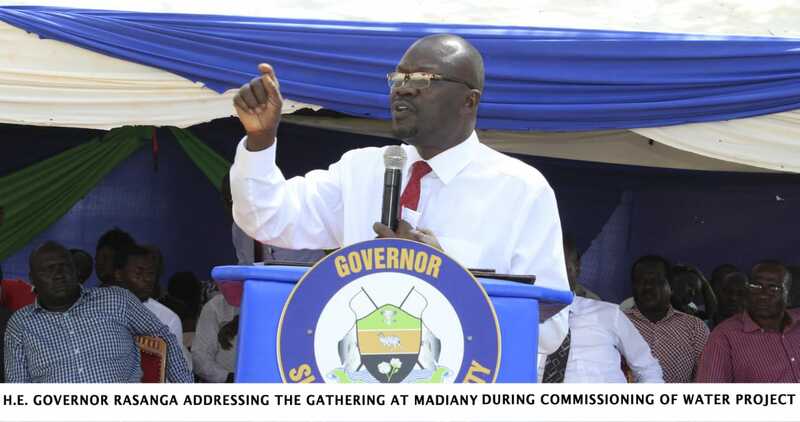 However, due to poor management structures, limited capacities, difficulties with revenue collection, poor accountability and unviable water tariffs settings, many schemes are not sustainable and are under performing. As a result, only 36% of the Siaya population uses improved sources of water, with 49% having access to proper sanitation. In order to address these water management challanges and effectively provide clean and affordable water to the target communities, the partners have agreed to adopting a Public-Private Ownership Management Model. 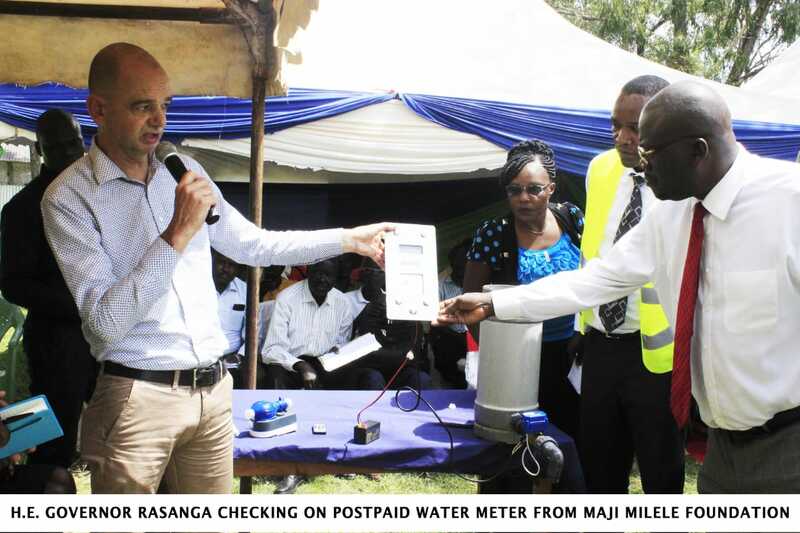 The private operator will be Maji Milele, a Kenyan Water subsidizing company of Dutch Company Water Forever International B.V.The public owner will be The County Government of Siaya and the local populations around the water schemes. From experiences gathered elsewhere, we hope that this management model will lead to sustainable water supply and that the water schemes that are currently not commercially viable, can eventually become commercially viable through the learnings from this noble project. The scope of work to be done in East Uyoma under the project will include purchase and installation of new low and high lift pumps, rehabilitation of the intake works and construction of one 50 meters cube steel elevated tank and repairs of existing ones. The project will also rehabilitate service tanks, water kiosks, filtration units, replacement of filter media, expansion and extension of distribution networks and installation of prepaid water meters. The East Uyoma Water Supply Scheme is estimated to cost KShs.41million at completion within the next six months with effect from 1st July, 2018 to 31st December,2018. The Naya Water Supply Scheme estimated at KShs. 11 million will see various works undertaken including purchase and installation of a hybrid pumping set construction of50 meters cube steel elevated tank, pipeline extension and installation of consumer meters. The four months project starts this 1st July, 2018 and should be complete by 30th October 2018. We look forward to the successful and timely completion of these two pilot projects so that we can continue with the three remaining projects as from next year 2019. I urge all parties involved to put their best foot forward and meet all the required standards of both projects within the set deadlines to address the current water crises affecting the identified communities.